The Père-Lachaise cemetery in Paris boasts one of the most impressive lists of artistic inhabitants entombed, enshrined or embalmed anywhere. From the kiss-covered final curtain of Oscar Wilde to Georges Bizet’s perpetual coda, the 118.6-acre property has enough related tales to fill hundreds of films. Leave it to Heddy Honigmann to turn her camera on this fabled location and craft a production that demonstrates the power of art on both sides of the equation of existence. From the opening shots of a treble clef, a plump spider working its web, an indication that Jim Morrison is a resident (as allusive here as in his rollercoaster career), a single rose of remembrance and young lovers embracing in this ocean of dead—oblivious to the storied inhabitants and the loyal army of local caretakers routinely going about their business, it’s abundantly clear that this tour will be much more than a survey of statues, marble and headstones. 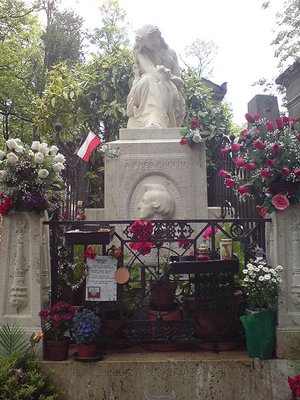 Happily for the film and the audience, Fryderyk Chopin’s fragile remains are a centrepiece of both the graveyard and the narrative. His music is brought to life by Yoshino Kimura who dedicates every well-crafted note to her music-loving, too-soon-dead father (overwork being the cause). At various times, the camera visits Kimura’s studio where she patiently practises the dreamy, ethereal repertoire. Better still, Honigmann pays back those teasingly delectable moments of beauty by closing the film with a complete take of the pianist’s inaugural performance of Nocturne No. 8 in D-flat Major. It’s rendered with moving understatement, only requiring a greater mix of abandonment and spontaneity to move into the realm of exceptional. That, too, will come. Always masterfully playing the cards she’s dealt with, Honigmann incongruously prepares the way for this mini-concert with the portrait of a Parisian embalmer who has a special place in his heart for the Italian painter and sculptor, Amedeo Modigliani. Inspired by such works as Portrait of Jeanne Hébuterne, the present-day artist-of-the-dead tries to “capture them, not their likeness” by skillfully removing signs of disease, stress or trauma prior to their last public performance. In his workplace, we meet the beautiful Elizabeth. As he plies visage-improving sponges to the angelic face, we learn that—due to blocked tear ducts—he never cries. This operatic-like twist is only topped by the historical footage of Maria Callas, holding herself in seemingly effortless rapture, performing a concert version of “Vissi d’amore” (Tosca). The embalmer finishes his work with the discreet application of lipstick. Moments later, these scenes are magnificently bound as the very-much alive Kimura reddens her own lips just before taking the stage to honour both the composer and her long-dead father. Marvellous. 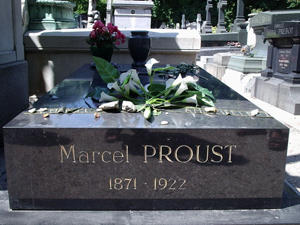 Much is also made of Marcel Proust. From admissions that “No, I haven’t finished In Search of Lost Time” to the unknown visitor who thoughtfully leaves a pen for the brilliant novelist to continue writing (several paint brushes are also left within easy reach of the famed artists who count Georges Seurat amongst their number) through a comic-strip artist who is making a surprising return on his books which translate the “blindness” of Proust’s word-imagery into colourful frames and text, it’s clear the French author continues to be relevant and alive in the minds and hearts of many. Another stroke of blind luck is the arrival of a South Korean man who smilingly admits that it took a decade to get through one of the world’s most important novels and that he’s travelled to Paris to bring the writer some cookies. Struggling in English to answer Honigmann’s question, the explanation for this interest flows easily in his native tongue; astutely, the director opts not to have his reply translated, letting the tenor and tone of his passion speak for themselves. Blind reality comes in the, at first, puzzling portrait of a trio of unseeing Parisians who sit down to hear a movie. Once the unmistakeable voice of Simone Signoret is heard (and briefly seen in footage from Les Diaboliques—thanks to a vault of a different kind), the prolific actor, like thousands of others, magically demonstrates how she still lives to act another day and will do so forever.